A flight suit once worn by astronaut Chris Hadfield is apparently now the property of a Toronto doctor who found it in — of all places — a local thrift store. "I thought, wow, what is a flight suit like that doing up there?" Dr. Julielynn Wong told CBC News, recalling how she stumbled upon the bright blue jumpsuit in one of the many second-hand stores on Queen Street West. Then she saw the name stitched on the left-hand side: Chris Hadfield. "My jaw just dropped. I said, 'I can't believe it.'" She says she bought it for $40, marked down from $80. The suit looks just like the one the former commander of the International Space Station is seen wearing on the back cover of his book, An Astronaut's Guide to Life on Earth. For thousands of years the human species is wondering about the world around him. What has changed dramatically in this search is how to find the answers. The great novelty of Science is the discovery of how to discover. In “Sorting the Universe” we will know how the application of the scientific method has led to elaborate theories like relativity, discover the DNA or know the structure of the atom. Cosmic dust is crucial to the birth of stars and rocky planets, and provides the elemental ingredients for life. But its origin is obscure. Many astrophysicists think that dust is forged during the explosive supernova deaths of massive, short-lived stars, yet some observations of supernovas near our galaxy indicate that they produce too little material to account for the copious amounts of dust present in the young Universe. In Nature today, astronomers lift the veil on the mystery, documenting the formation of dust in a supernova from just a few weeks after the explosion to almost 2.5 years after it. The study reveals the formation of oversized dust grains that were able to withstand the shocks of the exploding star. It also shows that dust production was slow at first, but later sped up. Most previous studies looked at each supernova for short periods of time, so “they did not tell us the full story of how much dust supernovas produce”, says co-author Christa Gall, an astrophysicist at Aarhus University in Denmark. She and her colleagues monitored the supernova SN 2010jl, first spotted in a nearby galaxy in 2010. Using a spectrograph on the Very Large Telescope on Cerro Paranal in Chile, the team measured the amount of visible light absorbed by the dust particles and the infrared radiation that the particles themselves emitted. The team's data are particularly compelling because they provide this simultaneous coverage at a range of wavelengths from weeks to years after the explosion, says astronomer Rubina Kotak of Queen’s University Belfast, UK. This provides information about both the size and the composition of the grains. Such coverage “is difficult to obtain for all but the nearest and brightest supernova events”, she says. The team concluded that the dust present between 40 and 240 days after the explosion must have been made of material expelled before the star went supernova, because the only other possibility would be the debris hurled into interstellar space by the supernova itself. And this is too hot to condense into dust particles so soon after the explosion, Gall notes. As the expanding shock wave from the supernova swept by in this period after the explosion, it compressed the previously ejected material into a cold, dense shell — the perfect environment for dust to coalesce and grow. To their surprise, the astronomers found that the dust particles were enormous by Milky Way standards, measuring 1 to 4.2 micrometers across — at least four times the typical width of dust particles found between star systems in our home Galaxy. It is harder to form large dust particles, notes Gall, but their size makes them resistant to destruction by shocks associated with the supernova slamming into interstellar material, and probably accounts for their longevity. Large interstellar dust grains have previously been found in our Solar System. During early observations, the amount of dust around SN 2010jl was relatively small, equivalent to less than one-ten-thousandth the mass of the Sun. But between 500 and 868 days after the explosion, dust formation accelerated and the dust mass increased more than 10-fold. The revved-up rate marks a transition to a second phase in supernova dust production, says Gall. Once carbon-rich material and other debris generated during the supernova has cooled sufficiently, it begins to coalesce into dust, speeding up production. At day 868, the last time Gall’s team observed the supernova, the amount of dust had increased to 0.04 of the Sun’s mass, or 830 Earth masses. If the increased dust production continues, in 20 years SN 2010jl will have produced the equivalent of half the Sun’s mass in dust particles, similar to the amount observed in the widely observed supernova SN 1987A. If numerous supernovae early in the Universe produced dust at a similar rate, it could indeed account for the dust observed in the young cosmos, says Gall. Librarian of Congress James H. Billington was joined by Emmy Award-winner Seth MacFarlane and Ann Druyan, the longtime collaborator and widow of astrobiologist Carl Sagan, to celebrate the official opening of the Seth MacFarlane Collection of the Carl Sagan and Ann Druyan Archive to the public at the Library of Congress. Vizual Statistix / Seth Kadish. Dependiendo de en qué parte del planeta se encuentre uno el movimiento circular debido a la rotación de la Tierra sobre su eje es mayor o menor. 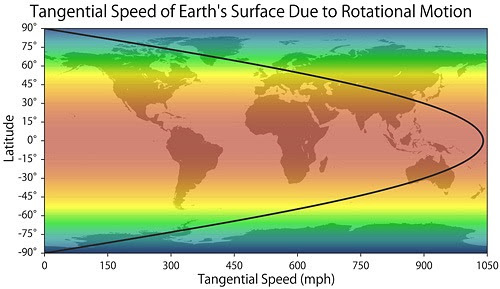 En el ecuador esta velocidad es de unos 1600 km/h y en cambio cerca de en los polos la velocidad del movimiento circular se reduce y llega a ser cero, ninguno. Aquí en España estamos girando a unos 1300 km/h según este gráfico de Vizual Statistix. Lo anterior sin contar la velocidad con la que la Tierra se mueve alrededor del Sol ni la velocidad con la que el Sol se desplaza por el espacio. Distant Horizons - Different Surfaces es una composición hecha por Mike Malaska en la que se ven las superficies de cinco mundos que hemos visitado, además del nuestro. De izquierda a derecha son el asteroide Itokawa, visitado por la sonda Hayabusa, la Luna, en una imagen de la misión Apolo 17, la última en la que dos seres humanos pisaron su superficie, Venus, en una imagen de la sonda Venera 14, Marte por Spirit, Titán visto por la Huygens, y la Tierra, aunque lo que salga es el mar, ya que cubre el 71 por ciento de su superficie. (Vía @Tokaidin y @LuisMendoTomas; localicé el origen vía Zemiorka).